Starting the year with a bang and breaking the box office numbers, Kartik Aaryan swiftly entered the 100 Crore Club with his outstanding performance in Sonu Ke Titu Ki Sweety. Since then, there has been no looking back for the star boy, he instantly became the favourite of all the brands and was titled as the heartthrob of the nation! While his fan videos broke down the internet several times, Kartik also became a favourite for all the fashion designers, keeping true to his title. Acknowledging his amazing work, Masala UAE awards 2018 have given him the BEST ACTOR award of the year and we couldn’t agree anymore. After all, the heart-warming smile, the sincere eyes, the uber cool style, the amazing moves and the melting performance did win our hearts. With that, the actor winning the BEST ACTOR award is no surprise for us. Kedarnath: Ahead Of Its Release, A Sigh Of Relief For The Makers! On work front, the actor recently finished Dinesh Vijan’s rom-com Luka Chuppi back in his hometown, Gwalior. 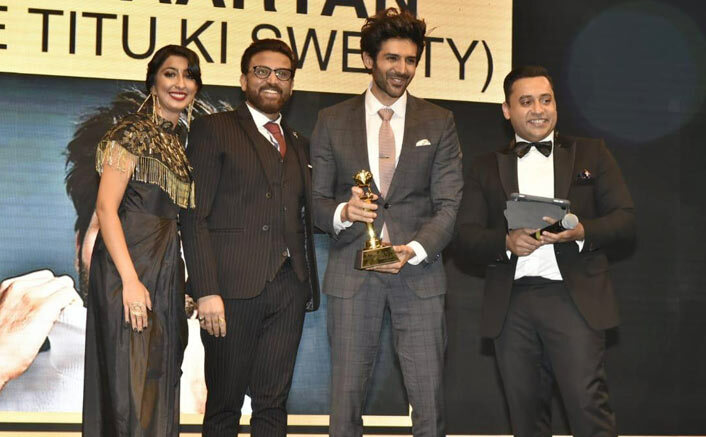 The post Kartik Aaryan Wins BIG At The Masala UAE Awards 2018 appeared first on Koimoi. Previous ArticleKedarnath: Ahead Of Its Release, A Sigh Of Relief For The Makers! Next Article Sara Ali Khan: I Hope Kedarnath Makes 100 Crores!